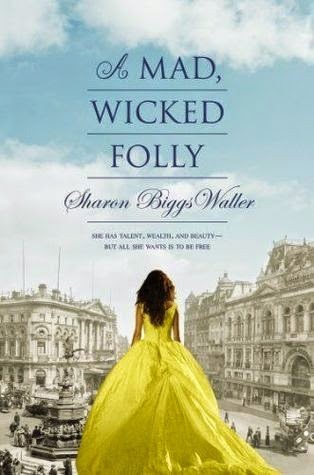 I picked up A Mad, Wicked Folly by Sharon Biggs Waller as a sort of return to my teen reading when I was into historical fiction. Mad, Wicked Folly was a bit of a roller coaster experience in which I went "I'm loving this," "No, it's a torn-between lovers scenario," "Wait, something different is going on here," "Yes, I love the art stuff." Vicky is the child of upper middle class parents in 19 ought England. These are rigid folks who have specific expectations of their daughters. Vicky, however, has a talent for art and a willingness to study it. I loved the art aspect of this book. I don't have any desire to create art, myself, my interest is in its historical and cultural aspects. I loved all that in this book. I knew nothing about the pre-Raphaelites. Now I'm beginning to know something about them. Vicky also becomes involved with the suffragist movement in England. Loved that, too. Waller uses the term "suffragette" instead of "suffragist," which always annoys me because I learned that the "ette"ending is derogatory. However, in her end notes she explains the suffragist/suffragette issue, definitely to my satisfaction. The torn-between-two-lovers thing, which was a little predictable to this experienced reader, was far more palatable to me because of the great art and feminist world that it existed in.The teenage Gail who read historical romances would have been far more appreciative. Reading this book made me realize that there is a way to get me to read romance. Have some really good content of another nature in the book.